Pomegranate Noir, I mean, can this sound any more delicious? 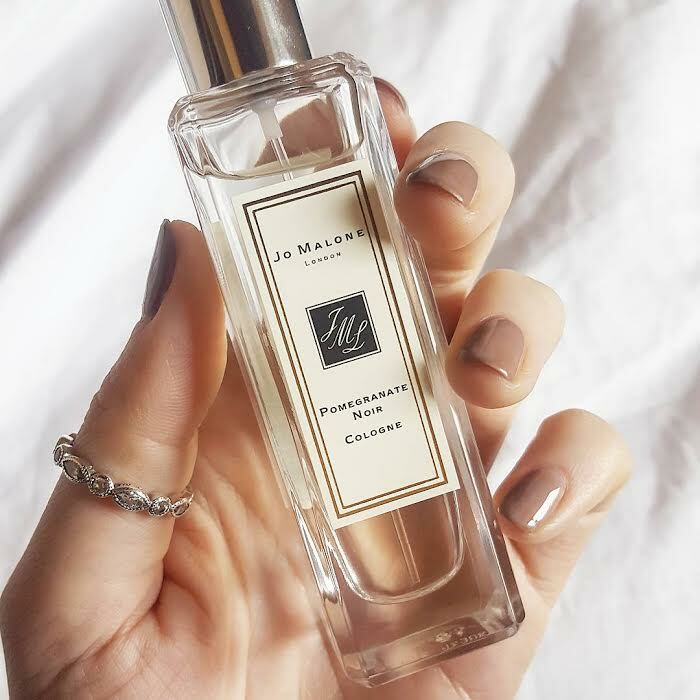 Of course, we are talking about the popular Jo Malone fragrance. If you read my recent fragrance post you will know that I am still discovering my fave scent but I am a huge fan of Jo Malone and typically really love the Peony and Blush Suede scent. I have seen Pomegranate Noir pop up recently on a few different blogger's Instagram feeds and I must admit I really loved the sound of this scent, kinda fruity but a bit dark! The website firmly places this scent in the fruity category, so when I went into my local store, I just went straight to it. I sprayed it on the card when I should have sprayed it on my arm but on the card you could really pick up the other fruity scents, but there was a real spiciness to it that I totally wasn't expecting but in nice warm, mulled wine, kind of way. I opted for the smaller bottle, because we all know how bloody fickle I can be with my fragrances. When I got home and sprayed it on my I realised just how deep and spicy it actually is. There is something about Pomegranate Noir that when it touches your skin, the really deep woody notes are released, along with the spicy pink pepper. I think these two elements really make it a little masculine but the fruitiness kinda brings it back to a slightly more feminine, it's said to have raspberry notes which personally I can't smell but I can definitely pick up on the pulm notes. It is more masculine than what I would usually wear but I think it goes perfectly with the weather. I would say that if you like floral or light scents you need to step away from Pomegranate Noir, this scent is not for you dear. I'm really glad I picked this up, it's such a lovely winter scent that when I put it on I instantly feel a bit festive and ready for Christmas. I actually think it would smell great as a candle too!